First I should explain that Mrs Nelson is not actually a person, but the boat that team Row-Like-A-Girl have been calling home for the past 40 days in their bid to be the youngest and fastest all-girl team to row across the Atlantic. In an earlier blog, I talked about how the girls had totally captured our imagination at Codestone and as we looked at ways to promote our new brand, we saw this as an amazing opportunity to associate our name with something truly inspirational while lending our support to these remarkable ladies. As I write this blog, Bella, Olivia, Gee and Lauren are just 30 nautical miles from reaching their goal. We are so proud of the girls and delighted that Mrs Nelson is carrying the Codestone brand. It has not been plain sailing, or even rowing. Right from day one they made us all nervous as they ignored the pack and headed south. This was a gutsy move by the girls to gain the advantage of the trade winds and to avoid a predicted low-pressure weather system that would hit the direct route on day five. This move paid off and placed the girls in second place, the position they have maintained throughout the race. As well as sea sickness, affectionately referred to as the ‘vomcano’, and sores that you just don’t want to imagine, the girls have also faced some significant challenges. Around day 24 the racers got hit by a storm with 30 knot winds forcing them to drop the parachute anchor and sit it out. Following this their water maker broke and despite 48 hours of running repairs, the girls have had to complete the race manually pumping water. However, worse was yet to come when the autohelm that they rely on to keep them pointing in the right direction broke. Initially improvisation with a screwdriver replacing the broken pin worked, but then the system itself failed and despite having replacements, these in turn both failed. This has left the girls having to manually steer the boat for the last part of the race. The two-hour rowing, two-hour rest schedule has turned into two hours rowing, one hour rest, one hour steering. A major challenge after already rowing 2,500 nautical miles. 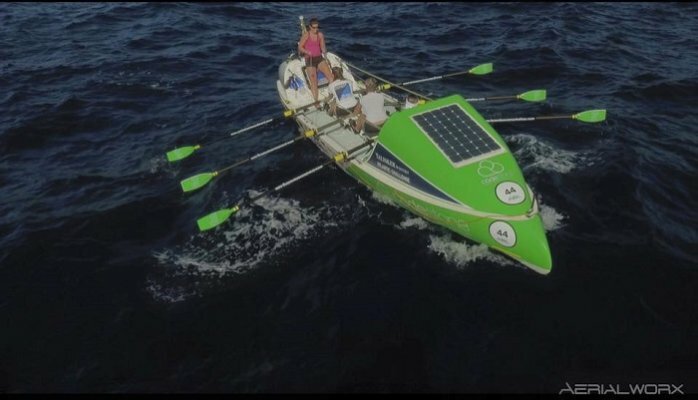 Despite all of this, Row Like A Girl look set to finish the race in second place, and achieving the goals of being the youngest and fastest all girl team to cross the Atlantic. We are so proud to be part of this incredible challenge. Mrs Nelson and the team have truly represented our brand – their efforts have been truly ‘inspirational’, four normal girls have ‘transformed’ themselves to ‘achieve’ something truly amazing. Well done girls from everyone at Codestone and we are really looking forward to you joining us for our Customer Day at Blenheim Palace on March 9th. This Blog was written by Dan Hobson, Commercial Director, Codestone.